The i3 concept coupe, shown, has a new design language created for BMW i cars. Compared with the i3 five-door, the three-door coupe has heavily sloping roofline, deeper rear-side windows and a more angled tailgate. BMW has provided the clearest hint yet that its lineup of i-brand electric vehicles will expand beyond the three models already confirmed for production with the unveiling of a three-door version of the i3 at the Los Angeles auto show. Lower and wider than the five-door i3 due to go on sale late next year, this version is officially billed as a concept. Senior BMW officials say cost and feasibility studies are already being carried out on the new car with the view to adding it to the i lineup, which also includes the futuristic i8 coupe and roadster. The i3 coupe shares its basic styling and carbon fiber reinforced plastic body construction with the five-door i3. Visual changes include a heavily sloping roofline, deeper rear-side windows and a more angled tailgate. BMW says the modular production methods developed for the i brand allow additional models to develop with less cost than conventional cars. Inside, the i3 coupe previews the production interior design for the i3 hatchback. It's less flamboyant than the design originally revealed at last year's Frankfurt auto show, with a simple dashboard that houses an integrated digital instrument cluster, a minimum of switchgear and a free-standing monitor. The majority of functions are accessed via an iDrive rotary controller mounted between the front seats. The steering wheel is a basic two-spoke unit with multi-function controls, the pedals are made from forged aluminum and the hand brake is electronically controlled. In a move that suggests the two could be produced together at BMW's factory in Leipzig, Germany, the i3 coupe uses the same hi-tech platform as the i3 hatchback. The so-called Life Module structure, with a 2570mm (101.2 inch) wheelbase, is manufactured from lightweight carbon fiber reinforced plastic. It has been designed for a plug-in hybrid electric driveline, named LifeDrive Module by BMW. At 3965mm (156.1 inches) long, the coupe concept is 119.38mm (4.7 inches) longer than the five-door. The existing Mini hatchback measures 3726.17mm (146.7 inches) long. The i3 coupe uses the same powertrain as the five-door. It includes a BMW-developed electric motor delivering 168 hp which drives the rear wheels through a fixed ratio gearbox. Electricity for the motor, which is mounted within the rear axle assembly, is provided by a lithium-ion battery pack mounted within the floor structure. The battery is charged by plugging into an external source and by kinetic energy produced under braking and periods of trailing throttle. A Driving Experience Control system helps to optimize the efficiency of the i3 by offering three driving modes: comfort, eco pro and eco pro+, each with its own throttle mapping, heating and cooling intensity as well as other energy saving functions. BMW claims a range of up to 160 kilometers (100 miles) in the most efficient eco pro+ mode, in which creature comforts such as the seat heaters, exterior mirror heaters and daytime running lights are switched off. BMW isn't making any official performance claims for the i3 coupe just yet. However, figures revealed for the i3 hatchback suggest it will hit 100 kph (62 mph) from standstill in less than 8.0 seconds and reach a top speed of 149.67 kph (93 mph). To maximize range in eco pro+ mode, top speed is limited to 90.12 kph (56 mph). The i3 can also run an optional two-cylinder range-extender engine which is used as an alternator to charge the battery. However, it isn't featured on the concept car in Los Angeles. 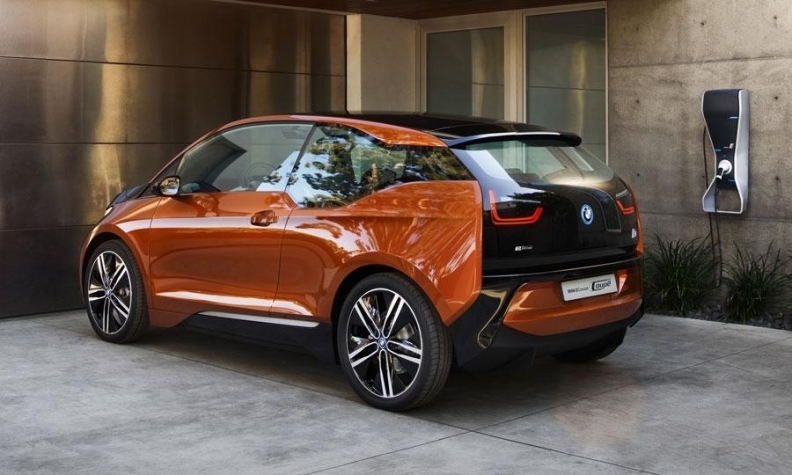 Such a setup will be offered on the i3 hatchback as a high-cost option, providing it with a theoretical range of more than 351 kilometers (218 miles), according to BMW. BMW is using the concept to showcase a number of new Internet-based functions for buyers of the i-brand car, under the ConnectedDrive banner. They include a navigation system that is claimed to provide accurate assessment of range based on real time traffic information. An eRemote smartphone application developed for both Apple and Android operating systems allows you to keep tabs on the state of the battery charge remotely, including during periods of plug-in charging. While BMW denies it is yet to make a final decision on whether it place the i3 coupe into production, a high-ranking insider has revealed to Autoweek, a sister publication of Automotive News Europe, that an i3 cabriolet is also among a series of future i-car proposals, suggesting BMW's fledgling i-brand lineup could eventually support at least five models. The automaker says sales of the i3 will initially begin in European markets.